there is a history of sinus problems in my family. my mother suffers more than the rest of us - she once had her entire head flushed out with hot running water pushed through tiny tubes. my father is never far from a pack of kleenex. my sister gets frighteningly bad nose bleeds. i have colds and headaches on a regular basis. we all live on sudafed - i used to smuggle it into japan when i lived there. thank goodness i can buy it over the counter here. i have had bad colds, fevers and a nasty case of tonsilitis in the eighteen months since i have lived in the UK. any time i have visited the doctor here (more frequently than i would normally, since contrary to popular opinion, i love the NHS...) i have been told that i have "chronic sinusitis" and am dismissed with a curt "you'll just have to learn to live with it" prescription. i managed to obtain a referral to the royal national ear, nose and throat hospital when i went in with huge white lumps on my tonsils last october. my appointment was booked for late february (all of a sudden, i'm not lovin' the NHS so much) and then moved to march 10th (now i see why people complain about the NHS!) regardless, i was looking forward to getting to the bottom of things. as a new patient, i was first subjected to an allergy test - cool! 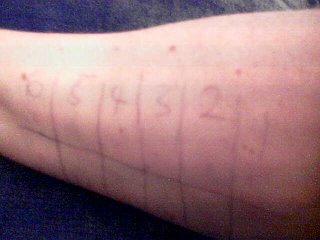 the nurse drew 12 boxes on my arm, then carefully put a drop of 12 different substances in each one, and pricked the skin to let the liquid enter my bloodstream quicker. any allergies would invoke a small rash to break out. next, i met with the doctor. we reviewed my history and he duly took notes. he took a quick look up my nose and then decided he needed to get closer. out came the medieval torture device: a long, skinny metal tube that he shoved up into my skull which allowed him to look directly into my sinus cavity. OUCH! long story short, i have no polyps or other undesirable growths on my sinuses. i do not have an overly admissable amount of mucus up there, either. my previous colds and bouts with strep and tonsilitis were just one-off viruses that my body combatted with sleep and fluids. i do not have chronic sinusitis. after four months of waiting, however, he must have known that i would want something a bit more satisfying than to be told that my occasional physical misery is just a fact of life to be dealt with. so he ordered a referral to a neurologist to look into my headaches and migraines. it might be months before i get to see another doctor, but next time i am determined to have a real problem. in fact, i think i'll start cooking up a killer migraine right now.